Move over Colonel, there is a new KFC in town! No I’m not talking your traditional or southern style fried chicken, but Korean Fried Chicken, which PO Chicken in Mesa is doing it right! PO Chicken is a family owned restaurant located in Mesa, AZ on the SEC of Dobson Road and Main Street across the street from the Mekong Plaza. On the menu at PO, you will find a variety of Korean porridges called jook, a spattering of other Korean dishes, and of course the main attraction, Korean Fried Chicken (KFC”). All chicken orders come with a complimentary side of cubed sweet pickled radish that is marinated in sugar and vinegar called danmuji and a Korean version of coleslaw. The dressing for the coleslaw tastes thousand islandish. Unless I am introducing friends to PO, yang nyeom is the only thing I order and in my opinion the only way to go. The yang nyeom chicken is slathered with sweet and slightly spicy sauce. The kick comes from dried Korean chili flakes called Gochugaru, that they use in their sauce. If you are a lightweight when it comes to spice, this dish may be the perfect amount of heat. But if you love spicy foods as I do, PO’s yang nyeom makes you wish they could turn up the heat a little more. Just to give you perspective, my daughters don’t do spicy particularly well. My 10-year-old has no issues with the heat, while my 8-year-old struggles with the spiciness but still trudges through. Take it from this Korean American who has been eating Korean Fried Chicken for nearly two decades, yang nyeom is the only way to go. A full-size order and maybe another smaller dish should be enough for two adults. If there were four adults, I would probably order at least two full orders plus another dish. Once we came with three adults, three younger kids, and a toddler, and we probably should have ordered three full orders plus an additional dish. When I come with my two daughters, one full-size order and another dish seem to always do the trick. PO Chicken is what I would describe as your typical mom and pop, no frills, no fancy decor, it’s all about the food restaurant. 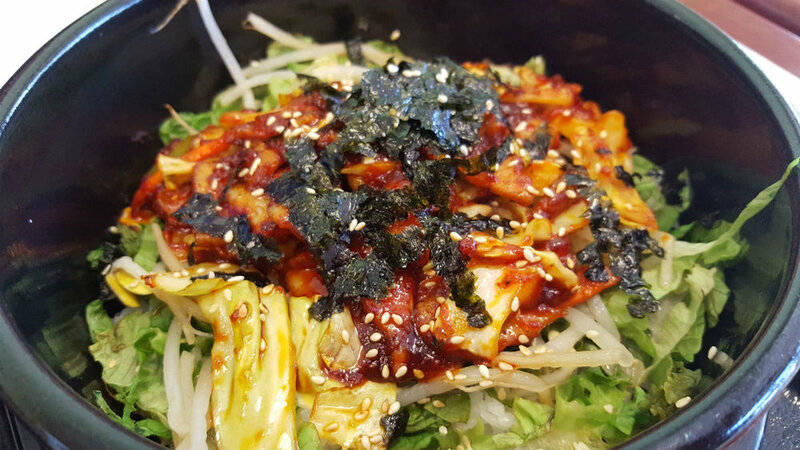 For all the Koreaboos out there, PO Chicken has your covered with KPop on heavy rotation. If you come at night, you may be in for a special treat as we were one evening. A booth full of college girls started singing along to KPop songs while eating their KFC. We even got a little extra as these girls decided to gyrate their arms as they danced to the songs while sitting and eating their KFC. However, if you are not looking for a quick chuckle, don’t worry as PO’s KFC will keep you focused on their chicken. With Korean Fried Chicken continuing to grow in popularity globally, PO Chicken is a welcome addition to the local food scene in the East Valley and metro Phoenix. For Arizona, I would highly suggest going to PO Chicken for your first bite of KFC or if you are a KFC OG looking to satisfy your KFC cravings. If you like to know more, please check out our podcast, Desert Dives.